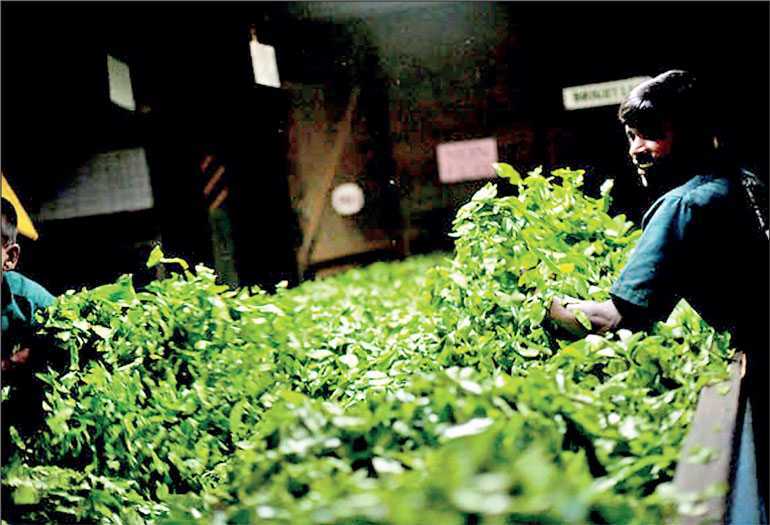 The Sri Lankan tea industry witnessed a moderate slowdown with decline in production, averages and exports in comparison to year 2017. The industry’s export revenue continues to witness static growth when compared to previous years. The fundamental challenge being the intrinsic volatility in the industry stemming from fluctuations in supply and demand, currencies, political climate in importing countries and policy decisions. Facing these uncertainties the industry must develop a resilient strategy to mitigate these risks. The total tea production of Sri Lankan tea for the year 2018 recorded 303.84 m kg in comparison to 307.72m kg for the same period in 2017 (-3.88 million kilos). The CTC mediums shows a substantial increase in 2018 in comparison to 2017 whereas most of the other orthodox and CTC elevational volumes shows a decline. Though production decreased by 3.8 million kilos, exports have decreased by 6.6 million kilos compared to the same period in 2017. The total national average of teas sold for the year 2018 was Rs. 582.55 ($ 3.59) per kilo in comparison to Rs. 618.14 ($ 4.05) (-Rs.35.59) for the same period in 2017. Low Growns having the largest market share with 63.2% of the production recorded a decrease of (-Rs. 36.61) with Mid Growns recording a decline of (Rs. -41.68) and High Growns recording a decrease of (-Rs. 29.42) when compared to 2017. Low Growns averaged Rs. 600.79, Mid Growns recorded Rs. 521.86 with High Growns at Rs. 571.51 for the cumulative period of January to December 2018. Sri Lankan tea exports for the period January to December 2018 amounted to 282.36 million kilos. A decrease of (-6.62) million kilos compared with the same period in 2017. The FOB average price per kilo for this period stood at Rs. 820.75 in contrast to Rs. 807.44 (Rs. + 13.31) when compared to year 2017. The FOB value of Tea Bags has moved up in comparison to the same period in 2017. The FOB value in Tea Bags recorded Rs. 1392.04 per kg for the year 2018 vis-à-vis Rs. 1321.19 per kg in 2017 (+70.85). Its export volumes show a marginal decrease. Teas in packets showed a marginal price increase YOY whilst teas in bulk remain static. 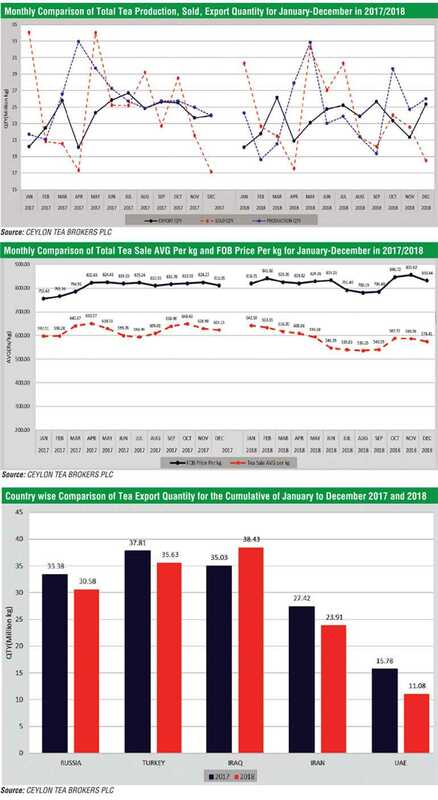 Country wise analysis of exports shows that the Iraq remains as the largest importer of Sri Lanka tea for the period of January-December 2018 followed by Turkey and Russia. However, tea exports to UAE, Iran, Russia and Turkey have dropped by 4.71 m/kg (-29.82%), 3.50 m/kg (-12.78%), 2.80 m/kg (-8.39%) and 2.18 m/kg (-5.77%) respectively compared to the previous year whilst tea exports to Iraq has increased by 3.40 m/kg (+9.71%). Tea exports to Syria, Libya and Saudi Arabia have increased by 2.78 m/kg (+37.58%), 2.08 m/kg (+17.89%) and 1.17 m/kg (+26.59%) respectively compared to the corresponding period in 2017. In terms of the US$ equivalent, based on the respective weighted average exchange rates, export earnings amounted to $ 1.43 billion in 2018 in comparison to $ 1.53 billion in 2017 with $ 1.26 billion in 2016, $ 1.34 billion in 2015 and $ 1.63 billion in 2014. Drop in tea exports in the year 2018 was mainly due to the drop in production as well as the political and economic uncertainties globally such as economic sanctions imposed on Iran. When it comes to the top national economies globally, although the order may shift around slightly from one year to next, the key players are usually the same. Top of the list is United States of America. However, China has been gaining on the United States, followed by Japan, Germany, United Kingdom, India and France. This year the global economic growth should remain resilient, but escalating trade tension between United States and the rest of the world especially China represent the main down side risk to the global economic outlook. Analysts expect global economy to grow 3.2% in 2019 while in 2020 the global economy is seen decelerating to 2.9 % growth. This year the Asian region (except Japan) will likely to feel the pinch from rising trade disputes cooling growth in China. Eastern Europe is likely to lose steam on slowing growth in EU and a sharp slowdown in Turkey. Despite higher oil prices, mounting geopolitical risks and a sharp recession in Iran will dent growth prospects in the Middle East and North Africa. While economic recovery in sub Saharan Africa will gather steam in 2019. The dollar is expected to remain a dominant force in the currency market in year 2019 and the pound sterling will succumb to the Brexit uncertainty. The Federal Reserve is expected to raise interest rates in a sustained manner this year. Historically the Sri Lankan rupee reached all-time high of 182.80 in January 2019. The rupee depreciated 10.5 % in the first nine months of 2018. Given the foreign debt payments due over 2019-2022 the rupee is expected to depreciate further according to Moodys’ investors service. Sri Lanka is one of the most sensitive to rising global interest rates. Moodys’ indentifies Ghana, Mongolia, Pakistan, Sri Lanka, Zambia and Turkey as the emerging frontier market sovereigns most vulnerable to Dollar appreciation. International bench mark Brent Crude is forecasted to average $ 62.50 a barrel this year, Citing a surge in global production and a resilient US shale growth. An ongoing trade war between China and USA has concerns of an economic down turn which would likely to hurt oil demand. 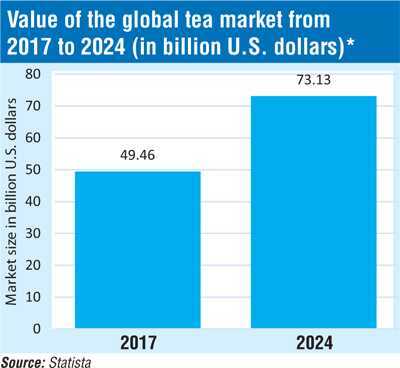 In 2017, the global tea beverage market is estimated to be worth about $ 49.46 billion, and is forecasted to reach to about $ 73.13 billion in 2024. On analysing the above, Sri Lanka has gradually lost out on markets that we once dominated. India seems to have gained in the mentioned markets and has superseded Sri Lanka in most of them. This indicates that protectionism would not boost the industry’s competitiveness and globalisation is an important factor to be considered with respect to the future of the tea industry. The Sri Lanka tea production inched its way over the 300 m mark to 303 m kg in 2018. After a volatile end to 2018, the year 2019 for the industry could be looked at on a positive note. With higher inflation and interest rates in 2018 the growth in global economy is set to ease off slightly in 2019. After sharp fall in oil prices seen in the last quarter of 2018 oil prices are set to recover in the first half of 2019 due to OPEC cutting supply. Therefore, a reasonable level of optimism should prevail given the above, however geopolitical instability in the Middle East and globally could affect the industries onward movement.